The strawberries and those blue pillows... to die for gorgeous. Do they still make slip and slides? I remember friends of ours had one--we loved it! cute pillows! I think that Las Vegas could inspire summer anytime of year...it's so hot there! Slip and slides are so fun! I love those pillows! Love the fabric on the pillows. 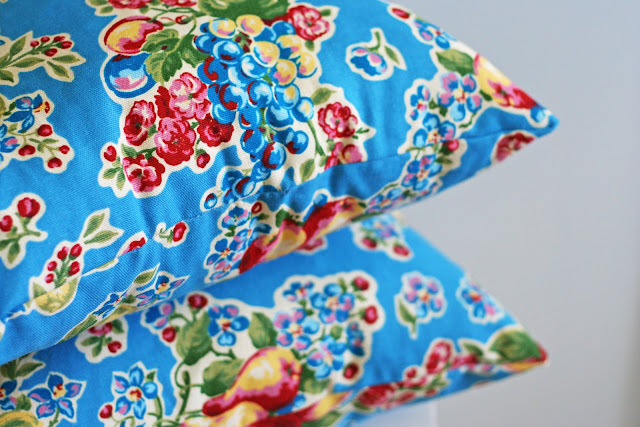 I am hoping to change out my family room pillows on my sofa and give them a summery look. Yes, summer sure is fun!!! 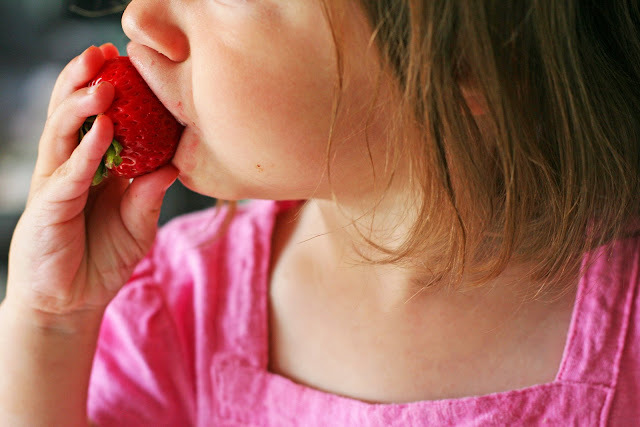 Love the pic of your little one enjoying those strawberries - yum!!! I love the fabric on the pillows. Sounds like a fantastic week to me! i must must must have that fabric...will you let me know who, what and where? looks like the little ones are having a good time...i love that little one she is such a cutie. Gorgeous photos! I especially love the little one eating the berry. I've been eating sooo much fruit, and I love it! Great pictures :D Love to see your little ones enjoying the heat with you. Yummy strawberries and lots of fun! Good for you! That is the most beautiful strawberry photo I've ever seen!!!!!!!!!!!!!!!!! And just so you know... I licked my monitor. I LOVE SUMMER, I LOVE EVERYTHING ABOUT IT...I LOVE THOSE STRAWBERRIES....I REALLY LOVE THOSE PILLOWS....SO DARN CUTE!! !HOORAY FOR summer! looks like great days...we are missing heat and really hope for some soon! 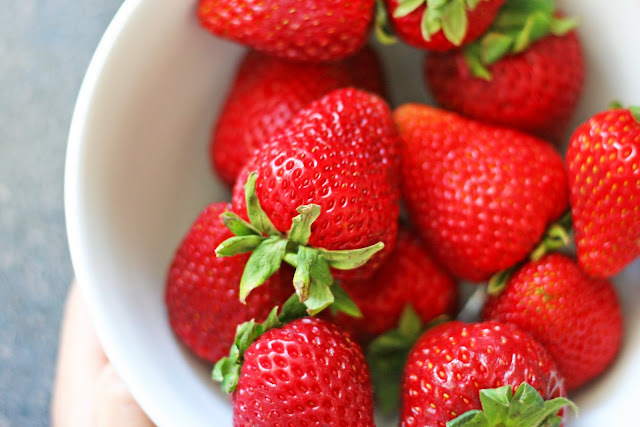 are the strawberrys from your garden? they look great! 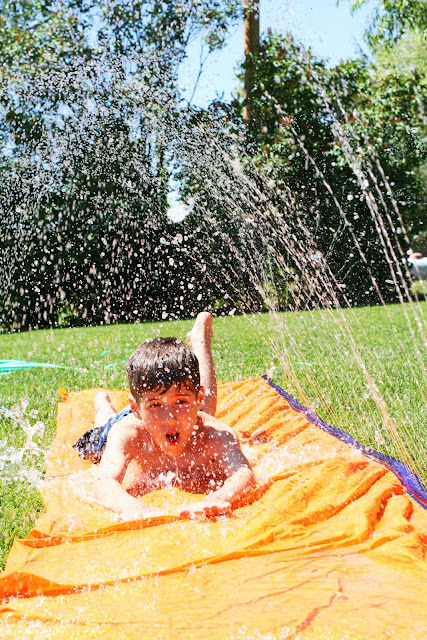 Ohhhhhhhh the slip n' slide...that is summer!!! Oh my! What beautiful pillows! What wonderful fun your kiddos look like they are having. i love those muddy days...oh how i miss them. my youngest is now 16. seeing your boys brought back memories of when i found my three kids in the pig pen, with the pigs rolling around in the mud. and yes, i got the camera before i did anything else. thanks for the reminder of what childhood is about. Is there anything better than fruit?! Seriously. I love it.